When I started thinking about this piece, I thought about it as just a list of my (many!) seemingly arbitrary rules for reading. Once I got started, though, I discovered that those rules actually tell you so much about me that they double as personality traits. In fact, they say so much about me that I’m actually a little uncomfortable sharing them now, but I’m going to anyway because I’m done with the piece; this paragraph is actually, chronologically, the last one I’ve written, and who wants to waste all that effort? 1. Always stop at the end of a chapter. Always. 2. Use specific bookmarks. I really do have a system for this. There’s a Harry Potter bookmark with a Patronus pendant only to be used when reading Harry Potter books. When I go to the library, I grab their colored cardstock ones for my library books. If I own the paperback, I have some cheap-but-cute bookmarks, brown-, red-, or black-beribboned, and I choose the one whose ribbon best matches the book cover. If I’m reading a hardback I own, I tuck the pages I’ve read into the dust jacket until the unread stack is smaller, then I switch sides. 2a. No dog-earing, bending, or folding of pages. On this point especially, my husband and I are opposites. For years, he worked outdoors and the machine he ran meant quite a bit of waiting while it did its thing; he spent that time reading. His copies of the books he read on those jobs are grease-stained and dog-eared, and the pages are falling out. 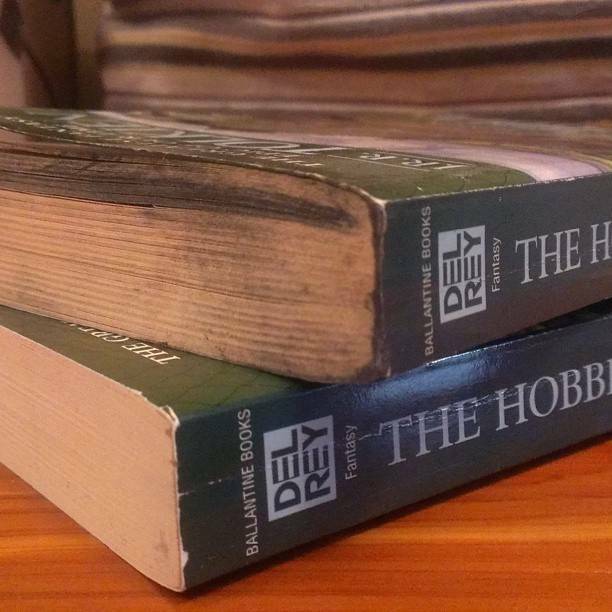 Witness our very different copies of the same book: his, top, grease-stained; mine with its lightly broken spine and general “survived three moves” scuffing. 2b. Weirdly enough, spine-breaking is fine, just don’t get too crazy with it. 3. Always read two books at once. This has only recently become a rule. Since I don’t like to buy two copies of a book (except out of necessity, like with A Song of Ice and Fire), I’m always reading something in ebook form for portability and a regular book for long-term sitting and reading. The two must be different enough that I won’t mix them up or lose interest in one. Right now, I’m reading Code Name Verity in ebook format and The Woman Upstairs from the library. One day, publishers will catch up with the music industry and offer an ebook download with purchase of a hardback. Until then, it’s two books at once for me. 4. No (or minimal) writing in books. No highlighters ever. 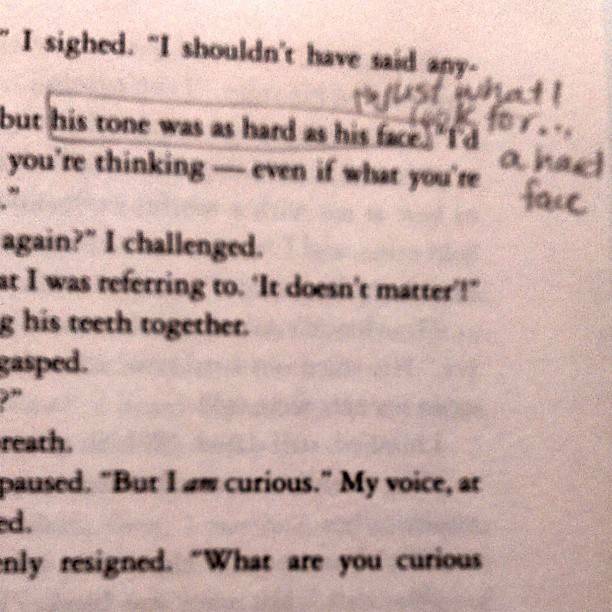 Marginalia mars my rereading experience should I decide the book warrants a reread. I like to approach books with as fresh an eye and as few distractions as possible if I do read them again, to ensure the possibility of taking something entirely new from them the next time around. Exception: Twilight. Without my marginalia, I’d have gone insane, and there’s no chance in hell I’m reading that again. Yes, I know what she probably meant, and I know his face is literally hard because of the whole like-marble thing. Still, come on. 5. Rereads must be earned because there are too many great books out there to read an okay one twice. My guaranteed rereads are: classics like Wuthering Heights, Jane Eyre, and the Alice books; Margaret Atwood and Sarah Waters novels; beloved series like Harry Potter, His Dark Materials, and the Looking Glass Wars; and my new favorite book, Summer and Bird, which I know I’ll revisit at least once a year from now on. Earlier I said that my husband and I take very different approaches to reading. We’re different in many other ways, too, ways that make perfect sense when you look at how we read. He is a multitasker, flexible, spontaneous. I am none of these things. If I multitask, all hell breaks loose and nothing gets done. I like plans with backup plans that have backup plans. I require six years’ advance notice for possible social engagements. Knowing only these things about us, a total stranger could easily separate our book collections. Sure, there’s the argument straight from Inkspell about leaving things behind in books, each reader and reading leaving a mark. It’s the “I like my books to look like they’ve been read!” argument. Then there’s the one that says books are like lovers, so there’s no universal approach for reading them. Some demand to be devoured; some long to be savored; some want the tenderest touch. As it were. Ahem. And then there’s batty ol’ me. Actually, my only argument is for the reading of books, however it makes you happy. I don’t expect anyone to follow my rules, nor do I recommend any of them (except maybe always stopping at the end of a chapter, which is a good one). Why would I? They’re crazy! Readers, do you have rules? Do they reflect your personality? And before you ask, why yes, I have been treated for OCD.